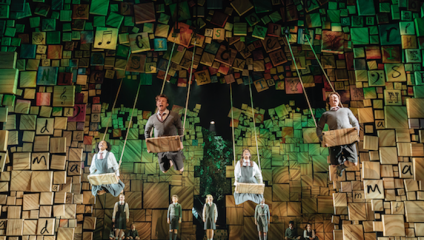 After spending 6 years in the West End, multi-award winning Matilda the Musical is returning to its regional roots by doing a UK and Ireland Tour through 2018 and 2019. We checked out the show at the Birmingham Hippodrome before it headed up to its current venue, the Manchester Palace Theatre. It’s a story beloved by Roald Dahl fans all over the world. Matilda, the imaginative bookworm with special powers, is unappreciated by her family, and can’t even escape her misfortune at school, as the institution is overseen by the tyrannous Agatha Trunchbull, the headmistress we’re all glad we never had (read our interview with Craig Els who plays Miss. Trunchbull here). It’s always a risk to adapt renowned classics, especially when they’ve already been transformed into an award winning 90s film with the much-loved child actress Mara Wilson in the lead role. But, in the hands of Dennis Kelly and quick witted musician and lyricist Tim Minchin, Matilda the Musical has become one of the best loved new musicals of all time, not least for displaying a plethora of young talent, as a vast cast of child performers execute tricky dance routines, sing tongue twister lyrics, and fill the stage with life and light. In fact, the familiarity of the book and the film works to the musical’s success, as audiences are wowed when they see pivotal moments from their favourite childhood story recreated before their eyes, such as spinning Amanda Thrip around by her pigtails and Bruce Bogtrotter being forced to eat a massive chocolate cake, which are all achieved without the help of filmic techniques. But it’s not all recreation, there are plenty of new additions to the storyline, and of course the ingeniously written songs alone make the production unique. Stand out numbers include Revolting Children, School Song, and a personal favourite was Smell of Rebellion of which, of course, the Trunchbull is the star, being paraded around on a gymnastics vault like a high kicking cabaret star. In comparison to the movie, the Trunchbull in the musical is much more of a source of humour, much of which is due to pantomime dame like performance. Although played by a male actor, she has various female quirks, which combined with her interesting physicality squeezed into a gym skirt and sports jacket for a session of “Phys Ed” creates a unique, villainous character that is at once both hilarious and horrifying. The set, designed by Rob Howell is also one of the stand out features of the show. The stage is surrounded with moveable, alphabet blocks, which spell out characters names in the show. There are also amazing features that are added and subtracted to the stage with ease, such as wooden swings that the performers use to fly towards the audience… and make spectators wish that they could have a go themselves! The set is put to particularly good use in School Song when, in a moment of musical theatre genius, the performers insert light up, lettered blocks into a metal frame in alphabetical order, as they correspond to the beginning letter of each line in the song. There are also moments of beautifully incorporated projection, which illustrate the whims of Matilda’s imagination, such as an animation that depicts the story of the acrobat and the escapologist that Matilda tells to the kindly librarian Mrs. Phelps. With its fun storyline, quirky aesthetic and promotion of reading over television, self-respect and standing up for what you believe in, Matilda the Musical is a perfect show to bring your “revolting children” to. But the show can also be thoroughly enjoyed by older members of the audience. In fact, parts of the show even take on a whole new resonance when seen through adult eyes. Whilst the opening scene showing parents pandering to the whims of their over-praised “miracles” is all too familiar, Mrs Wormwood’s comments about her post-pregnancy front bottom also prompts knowing laughs from many mothers. I even sometimes found myself identifying with Miss. Trunchbull more than Matilda, and, in a twisted way, respecting her commitment to her sport as described in the song Hammer, which appeals to the very British sensibilities of conformity and “stiff upper lip-ness”, stating that “if you want to make the team, you don’t need happiness or self-esteem, you just need to keep your feet inside the line.” This empathy for the show’s villain is testament to the work put into the Trunch’s backstory by the performers and director, making her a more 3 dimensional character, with reasons for being the way she is. However, this empathy doesn’t last long, as the purity and optimism of the young cast and Matilda in particular, reveals to you that your identification with the “baddies” in the story is because, in the process of growing up, you’ve become just as cynical and jaded as them. As a result, through the course of the production you are roused to return to your childhood dreams. The songs When I Grow Up and Naughty, are particularly successful in teaching you that you don’t have to just “grin and bear” negative aspects of your life, you can in fact “change your story”, but to do it, sometimes you have to be a little bit naughty. Matilda the Musical is currently playing at the Manchester Palace Theatre until 24 November 2018. It will then tour to venues around the UK including Wales Millennium Centre (4 December 2018 – 12 January 2019), Theatre Royal Plymouth (15 January– 16 February 2019), Alhambra Theatre Bradford (19 February– 23 March 2019 2019), Edinburgh Playhouse (2 April – 27 April 2019), The Bristol Hippodrome (7 May – 8 June 2019), Southampton Mayflower (11 June – 6 July 2019) and Norwich Theatre Royal (16 July – 17 August 2019).